Even consumers who say that they detest mail advertising will open and study direct mailings that promise interesting benefits, Debora Haskel of Minnesota’s IWCO Direct wrote in DM News. Three out of every four envelopes your prospects receive on any given day will be number 9 or 10, 24-pound, white-wove, Haskel says. People are likelier to open envelopes that are bigger, smaller, prominently windowed, or shaped differently or are more colorful, she advises. It is hard for prospects to resist the allure of something special inside the envelope, Haskel says. She cites the experience of a credit-card marketer who habitually used a plain-vanilla #10 mailing. Then he added a plastic card to his package. Result: a 30% lift in response. Check with your printer to make sure that any added bulk in your mailing does not disqualify you for USPS automation discounts, she cautions. “Adding texture to an outer envelope helps differentiate your package,” Haskel writes. Embossing or foil applications make the recipient feel instinctively that the offer is important – and that the prospect is important to you. Side pulls, double windows, zip strips, labels, stickers, perforated reveals, and self-adhesive notes on the surface of your outer envelope have increased response rates by up to 45%, Haskel reports. Nobody owes you extra work. So make it invitingly easy to read your mailing. Try setting body copy in 12-point (or larger) serif type, in a measure of 5” to 6”. And personalize (intelligently) as much as you can. 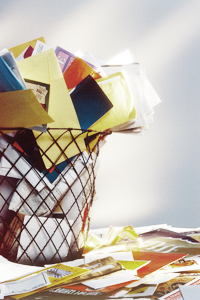 Yes, some direct-mail professionals prefer a layered response (offering, for example, information, or a selection of products, with a draft choice to be named later). Others urge simplicity. Only testing can tell you what is likely to work for you. In any case, offer a no-risk guarantee.